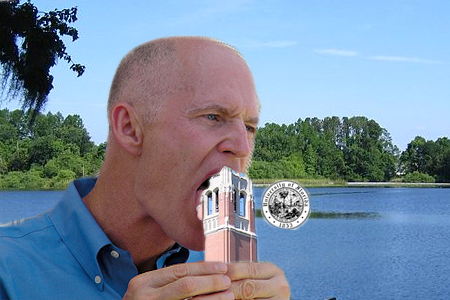 Rick Scott devouring Florida's university. Credit: Flickr/Wiki Commons/HNN staff. In Florida, a task force commissioned by Republican governor Rick Scott has proposed lower tuition rates for STEM (science, technology, engineering, and math) majors, allegedly in the interest of the state’s economy, but many of the state’s historians see the plan for what it is -- a threat to the humanities. "The punitive differential tuition model will lead not only to a decimation of the liberal arts in Florida," the historians said in the petition. "It will also have a destructive impact on the essential and transferrable skills that these disciplines teach." On November 16, Governor Scott Walker of Wisconsin joined Scott in proposing performance measures to ensure that students are "getting degrees in jobs that are open and needed today, not just the jobs that the universities want to give us, or degrees that people want to give us." An article by Michael Vasquez in the Miami Herald on December 8 questions the extent of the demand for STEM grads as well as the notion that higher salaries will be their reward. "Petroleum engineering majors are doing very well these days; biologists and chemists are not," he writes. And much of the demand in "strategic" fields comes from the healthcare industry, not from all of the STEM professions. Vasquez writes that when healthcare was not counted, one recent report found that "Florida was one of six states with more unemployed STEM workers than available STEM jobs. Of those six states, Florida had the biggest oversupply of STEM workers." But is there any significant demand for liberal arts grads? Last year, Governor Scott asked a business audience in Tallahassee a rhetorical question, well-reported in the Florida media: "Do you want to use your tax dollars to educate more people who can’t get jobs in anthropology? I don’t." Yet Vasquez tells us that a recent defense department study emphasized the need for sociology and anthropology graduates because the wars in Iraq and Afghanistan have "highlighted the importance of sociology and anthropology" and the nation should have an "ongoing investment" in both disciplines. The Florida historians note that the Florida Council of 100, a non-partisan organization of business leaders formed more than fifty years ago, "submitted a lengthy memo to the task force in which the Council noted the pressing need for ‘liberal arts grads with superior analytical, critical thinking, and communication skills who can quickly learn and apply industry/company specific skills." Knowing that liberal arts grads were in demand and that the differential tuition plan would further diminish the presence of liberal arts disciplines, the task force nevertheless persisted. And this is where the "disturbing motives" mentioned earlier come into play. Governor Scott’s mocking of anthropology as a discipline is but one indication of an intense war going on between the most extreme conservatives advocating higher education "reform" on one side, versus major public universities and thoughtful supporters, including many in the business community, on the other side. Readers who may question the use of the word "extremists" to describe these individuals should consider what Thomas Lindsay of the Texas Public Policy Foundation, Rick Perry’s designated "think tank," told the National Review, as reported on December 13: "The higher-ed establishment is an industry that is ripe for disruptive innovation, and that’s what’s happening," Lindsay said. It is this kind of "innovation" that came to such ripe fruition at the University of Virginia, where regents bedazzled by the trendiest terms coming out of business schools decided to bypass institutional history, collaborative change, and sound judgment to take a giant leap forward -- only to make fools of themselves. Sound judgment -- its formation and use, its value in every part of life -- is what is truly at stake in this serious battle over the future of public higher education. Historians, perhaps better than most, recognize that understanding what has happened, its relation to the present, and its likely impact on the future requires above all things careful and thoughtful judgment, based on a wide spectrum of information. The development of this enduring asset has long been the aim of the best universities. While the task force claims to know what constitutes essential information, the liberal arts caution against such assumptions, aware that truth often emerges from sources unforeseen. Lillian Guerra, one of the Florida professors challenging the task force, teaches Cuban and Caribbean history at the University of Florida. In an interview with Colleen Flaherty, writing for the Times Higher Education supplement, Guerra noted that the "Cuban state in the [1960s and 1970s] began to promote technical fields and the hard sciences because those are the fields believed to generate wealth for the collective aspiration, as opposed to an individual meditation on ideas."